In its NAB opening press conference, the media were able to get a full briefing on all of Sony’s new equipment for broadcast and cinema production. Most of the event was focused on cameras and other workflow equipment for broadcast production. But not all of it! While we won’t get into the details suffice it to say that broadcasting is becoming far more agile, flexible and efficient with trends for cloud operations, remote production, and IP solutions. All of Sony’s equipment will get SMPTE ST-2110 support for video over IP very soon, for example. For me the biggest impression was the 8Kx4K (32’ x 18’ 9.75 x 5.5m) CLED display. This is an RGB microLED video wall solution that was not only massive but showed incredible images – most of the time. I say most of the time because content that was shot at 24 or 30 fps showed huge amounts of judder when viewed close up. It decreased a bit with distance, but was still noticeable. Judder is known to be more perceivable as brightness increases and as the screen size increases (In my view, also as the resolution increases – Man. Ed.). Judder that was not objectionable on SDR content can now become objectionable if produced in HDR. Field of view matters too because large FOVs engage more of your peripheral vision, which is more sensitive to judder. But sheer size has an impact too. For example, consider a fast moving ball on a 65” display. Maybe the ball moves 1/10 of an inch between frames on the 65” screen but it could move an inch on the big 32’-wide screen. There are a number of ways to mitigate judder (there was a nice paper by Dolby from the Technology Summit on Cinema which I will report on elsewhere), but one important solution is higher frame rate. 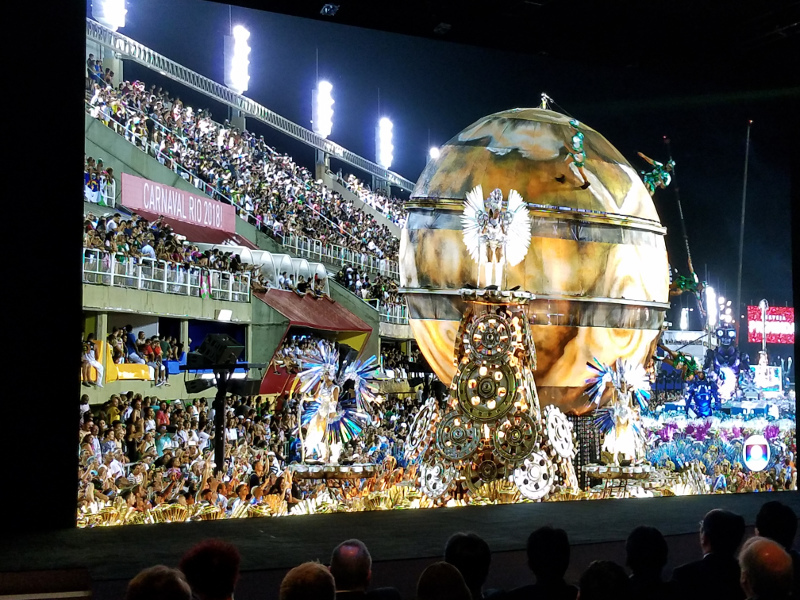 Sony said that for NAB, they shot some new Carnival footage using their new broadcast 8K/120fps camera (UHC-8300). This footage did not have the judder so noticeable on other sequences and illustrates the issues with low frame rate HDR content with high luminance (the Sony CLED goes to about 1000 cd/m²). This content looked absolutely fantastic, proving that frame rate matters. At the event, Sony also announced that Fox Sports has chosen this CLED for its studio set in Moscow during their upcoming World Cup coverage, from June 14 to July 15. 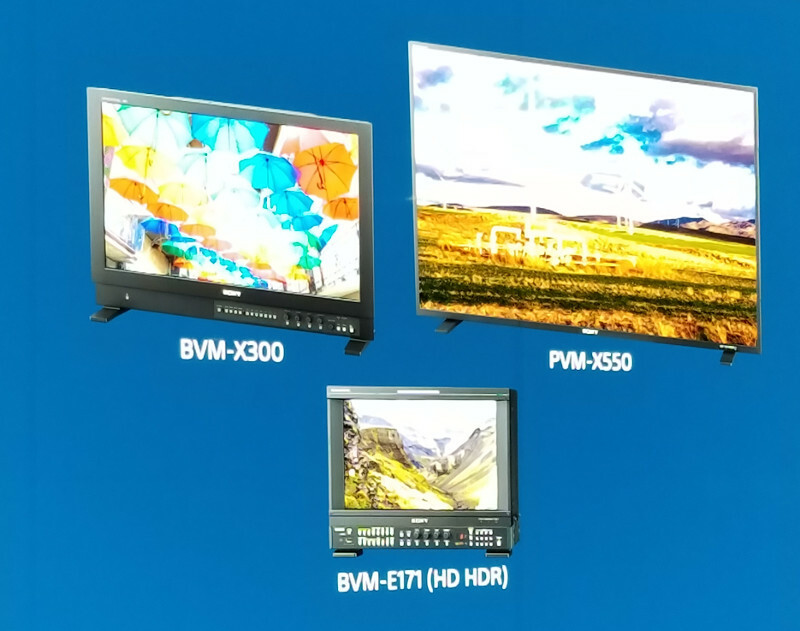 Turning to professional monitors, there were no new products introduced, but Sony highlighted their BVM-X300 OLED reference monitor, a workhorse for color grading, along with their PVM-X550 a 55” client monitor. The smaller BVM-E171 is for HD HDR applications. Sony said it is releasing firmware updates for these two monitors at NAB. The common feature upgrades are, Flexible Area Marker enabling two markers to be freely set on one 4K screen, Time Code Display capabilities for the display of LTC and VITC time code at the top or the bottom of the 4K screen, and New Input Setting to simplify a flow of settings into one integrated assignable button. High Brightness Mode for PVM-X550 delivers wider dynamic range to reproduce more realistic colors and to optimize 4K color grading with over 180% in HDR Peak Luminance, when compared to the current PVM-X550. 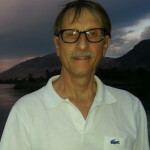 Gary Mandle, long time professional monitor expert at Sony, will also be retiring soon (say it isn’t so!). He has also been a knowledgeable, friendly, first class guy. We wish him luck wherever his wings take him. Of course, Sony had their latest TV models showing beautiful image. We learned that reviewers who tested the 100” Z9D flagship TV report that it can sustain 2900 cd/m² in a 10% window “for hours.” That’s impressive. Look for more coverage in our special show reports.